If you've always assumed that the idea proposed in Armageddon could save us in the face of a crisis, by destroying an asteroid to avert the destruction of Earth, think again. Physicists from Leicester University, UK, have calculated that such a feat would require a bomb a billion times stronger than the biggest bomb ever detonated on Earth. 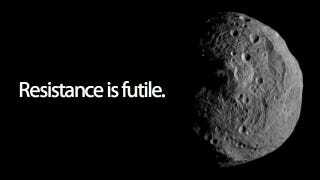 The team of scientists considered the energy dump required to neutralize the threat of an Earth-destroying asteroid. Using the asteroid from Armageddon as a yardstick, the team took into account the likely density of the asteroid, its speed, its proximity to Earth and a handful of other factors to work out how much kinetic and potential energy it had. Turns out that 800 trillion terajoules of energy would be required to split the asteroid featured in Armageddon in two, in such a way that both pieces cleared Earth. By comparison, the biggest bomb ever detonated on Earth—the Soviet Union's 50 megaton hydrogen bomb "Big Ivan"—provides only 418,000 terajoules. That a factor of a billion different. Of course, plenty of assumptions have been made along the way, not least that the asteroid in question was spherical and that the film's suggestion of it being the "size of Texas" held true. Aslo, the further away the hunk of rock is when it's spotted, the less energy would be required—and in the movie, it's not seen until very late in the day.